All right, I think I’ve regained my synapses. Sixie, in his capacity as Cool Dad, takes young Flip to the theatre in Victorian England for some edification. Finding the theatre closed, he seeks out Henry Gordon Jago, George Litefoot, and Ellie Higson (Lisa Bowerman) in their usual haunt. Really, the audio could have stopped there: all these actors are so much fun, playing distinctive, colourful characters that are a joy to listen to. There’s a feel-good cast party atmosphere when they all get together. However, a drama without conflict or plot makes poor play, so the friendly social call can’t last. Dr. Litefoot has a murder mystery to solve, while Flip and Jago trot off to discover what Jago’s new patron is doing behind the scenes. The two of them get along well, while Litefoot and the Doctor have a gentlemanly rapport that’s a delight to listen to. Gradually they discover what’s clear from the opening scene: someone (okay, yes, it’s the Valeyard, we know that voice) is toying with echoes of the Doctor’s past, and for some reason he thinks it’s a grand idea to recap famous moments badly. Does he mean to kill us all by making us gnash our teeth at iconic scenes being butchered? I’m reminded of The One Doctor, except that in this case the touches of humour leaven a far more sober tale about mortality and lost potential. There’s some sly meta-commentary on the production of Doctor Who, hinted at through metaphors of acting and staging. 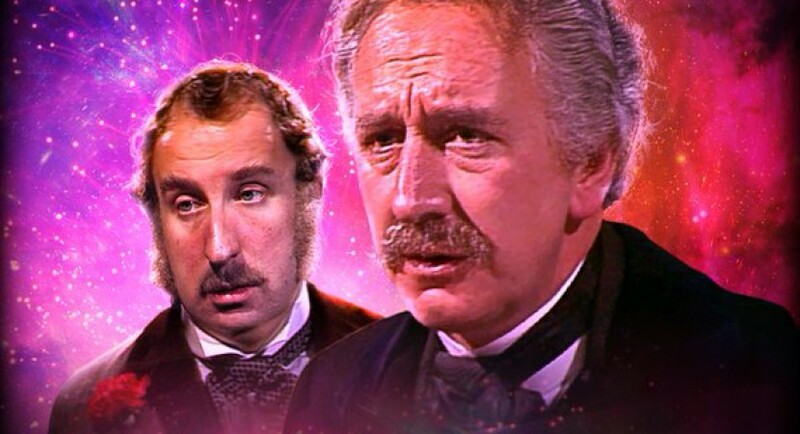 The Doctor and Litefoot also have some thoughtful exchanges about death and the Doctor’s own nature. Possibly a little too on the nose, but I appreciated the food for thought bubbling beneath the surface of a standard “find and foil the villain” adventure. Much like “Winter,” the longer I listened, the more I noticed the subtext and symbolism hidden behind the staging. Except in this case, the characters and setting are real, ordinary, and mundane, concealing the meta rather more subtly than in a Jungian dreamscape. For me, the star of the story was Flip. Normally I find contemporary pop/geek references dropped into the show annoying, but she reminds me of dear Jo back in the day (“It’s a song by the Beatles”). She’s plucky, foolishly brave, funny, and very sweet. Okay, yes, she’s a lot like a 21st-century Jo. I can see why Sixie took her under his wing. (No spoilers, please, although The Widow’s Assassin has already spoiled me). In fact, all the Doctor’s friends have lovely parts to play in this. I’m fond of Doctor Who for its companions, and this story definitely hinges on them. I’m not giving sufficient credit to Michael Jayston, because it’s difficult to do so without spoilers, but he’s a great villain. I had somehow forgotten his mastery of the evil villain laugh. Some saccharine Power of Friendship clichés tie it off rather quickly, but I had a lot of fun with this one. In a sense, this adventure is Sixie’s version of the memories of past companions washing over him during his dying moments, except that it happens in advance so he doesn’t realise it. *About Lisa Greenwood: she was 17 when she started as Flip, possibly even younger than Matthew Waterhouse. In the Behind-the-Scenes interviews, Nick says gentle things about how she “grows every time we work with her.” He says that she always had “brilliant” instincts, but is now better able to understand and respond to a director’s coaching on those occasions when she needs some help. The Doctor may have killed off (the careers) of some aspiring young actors, who began with the show and then “disappeared.” Ouch. Litefoot: “We spend more time with death in all its various forms than is healthy.” The foreshadowing in this story is brutal, as it so often is before regenerations.